The Longevity Kitchen cookbook shares the flavors, habits, and diet of people in Japan, who are renowned for their longevity, with Japanese women having the longest life expectancy of 86 years. In this tasty soup, the authors, Katz and Edelman, add an unusual element to a miso based soup — green tea! It adds an alluring herbaceous note to the soup. For a gluten free version of this dish, be certain that the soba noodles are made with 100% buckwheat, which isn’t actually a wheat and is gluten-free. My favorite thing about this recipe is that it works with just about any ingredients you have on hand: any leafy greens work; I love it with radish, salad turnips, ribbons of carrot. Whatever you choose! 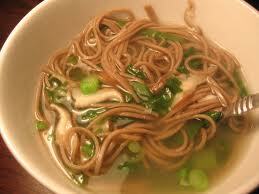 Cook soba noodles according to package instructions. Rinse with cool water and divide among 4 bowls each drizzled with 1/4 teaspoon of sesame oil. Pour stock into saucepan with kombu and tea bags. Bring to a boil and simmer 4 minutes. Discard kombu and tea bags. Add the greens, shiitakes and tofu or shrimp to the simmering broth and cook 5 minutes. Stir in the snap peas, Tamari, miso, and lemon juice and cook another 2 minutes. Ladle soup over noodles and serve hot.